Description: Difficult – ideal for intermediate to experienced riders. Loads of fast flowing purpose built single track, river crossings and jeep track. Lots of climbing to amazing viewpoints and one portage section. Follow the single track all along the Onrus River on your left. Enjoy the scenery and the lovely flowing river leading your way up the valley. Look out for your first big river crossing to your left and get ready for a nasty climb. The single track will take you upwards towards stunning single track down to trails, which runs parallel to the Camphill road. These trails are designed to keep you off the road and safe from traffic, but you are welcome to use the road, but remember to obey all traffic rules. Just before you reach Camphill farm and school you will join the road again. Follow the signs and keep left. Next will follow another climbing section on the route. Look out for the cement bridge crossing and stunning trails carved into the mountain as well as sandy sections going uphill. Get into an easier gear and keep the cadence high and before you know it you’ll be at the top. Stunning views over the valley will take your breath away before you start a tricky windy descent through the fynbos. Be careful that the fynbos does not get hold of your handlebars as it might result in a closer inspection of the fauna and flora. The trail joins the red and blue route again here at Volmoed. Follow the black arrows past their well-manicured lawns and please respect the retreat’s privacy. Remember you are on private land and it is our privilege to cycle here. You are about to attempt one of the most scenic ascents in the Western Cape. Be on the look out for waterfalls, pristine fynbos and the odd baboon. During this ascent you will encounter a compulsory portage section. Be careful and help one another up the stairs. Remember to stop and look around at the scenery – its breathtaking. About 1.5km on this district road will lead you to the turnoff left, to Sumaridge Wine Estate. The trail will take you through their vineyards, past some horses and along their dam at their wine tasting facility. Feel free to drop in and have a taste. 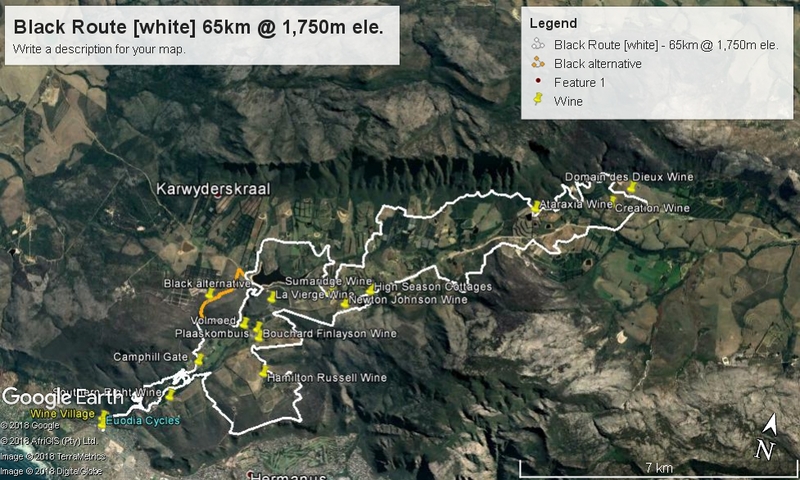 The black route slips away from the red route and you will meander through the vineyards all the way to another district road. Turn right and follow the signs all the way to the R320 again. Cross the R320 and stay on left side for about 500m and you will then go through a gate where you will need to enter the code given to you when you got your permit. This is High Season’s property and you will wind through their self-catering apartments on route to Newton Johnson Vineyards. Attack the climb to the highest point on route. From this vantage point you will again have magnificent views over the valley. You are about to make your way back towards the sea again. A very fast descent will lead you to Bouchard Finlayson Vineyards and you will also past their tasting centre. Again a good reason to stop and do a tasting, but be careful, because just after this descent the final climb of the day awaits all the way up to Rotary drive via Hamilton Russell’s vineyards and fynbos. Leave something in the tank for this climb, but be assured it will be well worth it. Once you’ve reached the top at Rotary Drive, take some time to savor the view. Look out for the whales while you catch your breath. A fast descent on a district road follows and please be on the look out for the turnoff/arrows to the right at the face bricked farm gate. Yet another fast and semi technical descent follows taking you all the way down to the R320. Remember to ride within your limits and you’ll have nothing to fear. You will cross the R320 tar road (please be on the look out for the cars) and join some jeep tracks until you will do an amazing river crossing onto some of the most beautiful trails you will experience. This time the Onrus River will be on your left till you meet up with the Camphill road again. After crossing the bridge turn right to join the now familiar double single track on which you started, all the way back to the Hemel en Aarde Village.